I'm hitting the road shortly for a quick trip to Red Deer. AUMA is hosting a President's Summit on the future of Local Governance and I'll be representing the City of Grande Prairie. "This two-day event is designed to help municipally elected officials, senior administration, community leaders and other stakeholders explore the future of local governance. Participants will learn from speakers and experts, from both inside and outside the province, about Alberta municipal governance (Alberta municipalities), with a goal of building AUMA’s 2009 Policy Options Report on the Future of Local Governance." The word is that the Provincial government is looking at updating the Municipal Government Act, but is waiting for input from this AUMA process and the 2009 Policy Options Report mentioned above. Like any good event it comes with some homework so over the last couple of nights I've been digesting the background discussion papers. If you want to read a pretty reasonable look at some of the most important issues facing Alberta communities today I really recommend the Discussion Paper (link to pdf) in particular. So, I'm driving down today so I can be there for the morning start tomorrow. If the event was in Edmonton I might have flown and gone Thursday morning but with no direct GP to Red Deer flights that's pretty tough. On top of that I'll be heading home right after things wrap up on Friday afternoon - I need to be back to go to the Rotary Greenathon on Saturday morning. I'm glad I have satellite radio! Wow! I just received the following note from GPRC; Dr. Scott McAlpine will be leaving Grande Prairie to take on a positions as President of Douglas College in BC! Scott has been a fixture in GP for quite a while and is probably one of the names I'd most associate with the college. More recently he's been heading up a lot of the action at the Centre for Research and Innovation. Well Scott, congratulations - you'll be missed. ... and in related news a position has just opened up in GP; moderator for all future political forums. "It is with both pride and regret that Grande Prairie Regional College congratulates Dr. Scott McAlpine on his appointment as President of Douglas College in BC’s lower mainland. Dr. McAlpine will assume the presidency of Douglas College in mid-August of this year, leaving GPRC and the Grande Prairie community after over 20 years of commitment to students, to the College, and to a wide range of community-building initiatives. Since arriving at GPRC, Dr. McAlpine has been “the voice” of political commentary in this region, providing background and analysis to news media during every local, provincial or federal election, and offering insight into events throughout the world. He taught political science classes on campus in Grande Prairie and was among the first instructors to engage students in more remote locations via video conference, and has always been a proponent of access to advanced education for students of our region. Dr. McAlpine served as Chair of Arts, Commerce and Education at GPRC from 1999 to 2005, when he was appointed Dean of Arts, Science and Education. Dr. McAlpine has many strong connections with the greater Grande Prairie community, through work with the Chamber of Commerce, Community Futures (formerly SMEDA), South Peace Planning Council, School Boards and Canadian Parents for French, to name a few. As leader of the Integrated Research Unit at the College for several years, and a key player in the eventual establishment of the Centre for Research and Innovation (CRI) by the College and PREDA (Peace Region Economic Development Authority), McAlpine has contributed enormously to the research activities of this region. Budget Surplus 2008 - What Should We Do With The Green? In my last post I discussed how the city ended up with a surplus of approximately $1.4 million dollars at the end of 2008. Tonight council will decide what to do with that surplus - there are least a couple of options, and one that I think is particularly important. Generally when a year ends of with a surplus it goes in to a "Financial Stabilization Reserve". Sorry, sorry ... let me correct that; any surplus money that council doesn't choose to direct to an emergent project or priority goes in to the Financial Stabilization Reserve... but before I go on to that let's finish looking at the reserve first. Currently the reserve sits at $4,718,845 and although that's a decent amount it's only equal to 3.2% of 2009's operating budget of $146,276,063. That's a pretty small reserve for example; if we divided that total operating budget by twelve you could say that it takes roughly $12.2 million dollars per month to keep the city running. Looking at it that way, the reserve covers about two weeks of operating the city. Of course that's a pretty simple way to look at it but you get the idea, it's not much of a reserve really. Following hot on the heels of the motion to move the surplus into the reserve will be a motion to provide a grant to Aquatera for the support of waste diversion programs at the landfill. This grant would be funded by using a portion of the surplus. I don't think its any secret that Aquatera has been in the news lately there are some concerns with it's financial outlook - revenue has dropped in many places and it's obliged to pay it's shareholders (the City, County and Sexsmith) certain amounts each year. This obligation is a problem and we've been trying to correct it. In the interim though, the loss of revenue means that Aquatera has had to make tough decisions about what services it continues to offer. Until I was removed in February when I was on vacation, I was on the board Aquatera board for some of these discussions about what to cut. The consensus was that we had to make sound business decisions based on financial information. For it's survival Aquatera has to keep doing the things that make money and stop doing the things that don't - that's pretty straight forward. The difficult part is that Aquatera really is a company that takes environmental implications in to account when it does it's business. It supports reusing, recycling, cutting CO2 emissions, and diverting things from the landfill if there's another use for them. Unfortunately a lot of that stuff isn't a money maker, especially right now. So the board decided to discontinue some of these "right-thing-to-do-but-no-money-in-it" kind of things unless there was some other funding to cover them. Since the landfill is actually the City of Grande Prairie's (the County and Sexsmith have their own that Aquatera is not involved in) I suggested that the board request the City help with funding them and a majority of the board supported that motion, which sent a request to the environment committee. So, tonight there's a motion on the agenda for the city to make a one time grant to Aquatera of $605,000 to support these programs. I think that number is a little high; firstly I believe the Building Material Recycling centre can be run at less of a subsidy, and secondly those numbers reflected a full year's operation... and it's the end of April now. Those two points aside, I'll be supporting the grant because I believe we have a responsibility to minimize what goes into our landfill. I think that in the long run it makes financial sense (the less that goes in to the landfill, the longer it lasts and the longer we can put off buying land for a new one). And finally I believe that it's how residents of the City expect their landfill to be managed. There was once a politician that basically said it was less expensive to bury something and forget about it. I disagree. Budget Surplus 2008 - How'd We Get It? Tonight at our regular council meeting we'll be discussing the results of our 2008 Audited Financial Statements, and what to do with the surplus of $1,461,116. I know that there are those who will say that any government surplus is a sign of over taxation, so before going any further I feel I should address that point. Firstly although $1.46 million is a big amount if you look at it in perspective it's equivalent to approximately 1% of the total budget (capital and operating budgets totalled $140,133,123 - you can see a pdf of the consolodated financial statements here). Staff also manage the city's finances pretty closely and that saves money too. For example part, of this surplus is due to "cash management" on our capital projects like the library and service centre renovation. The budget included paying the "mortgages" on these projects, in the case of the library staff didn't borrow the money until payments on the construction were due (that saves a bit in interest) and the service centre renovation didn't start as early as planned, staff won't "borrow the money" for it until needed so we've delayed a few payments. So there's some of the reasons we ended up with a budget surplus - check my next post to see a discussion on what we (should) do with it. Yesterday at the city's Protective Services committee meeting we had a number of concerned community groups come forward to speak about the closure of the Young Offender's Centre in GP. This facility serves not only GP but also the whole NW corner of the province with kids being sent here from communities as far north as Fox Lake, High Level and Ft. Vermillion areas. It appears that the centre was a victim of the recent provincial budget. - The youth will now be in a larger population of "inmates" increasing the chances that they will be exposed to (and become involved with) gangs and more serious offenders. - Families from northern communities now have a long way to go to visit the kids and it's pretty well recognized that as soon as you take away a support network your chances of getting these kids "back on track" drops dramatically. So, for those reasons and many others people have begun rallying to see if they can affect the government's decision. The goal is to have the centre reopened and the youth transferred back here (I understand that some or all were being sent out today). 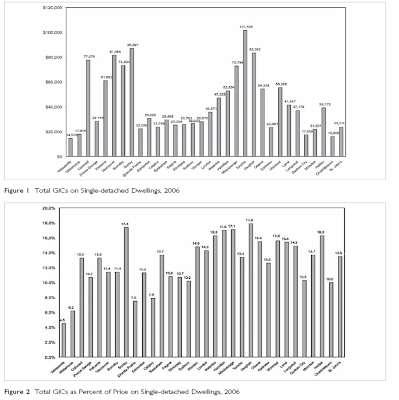 CMHC has a recently released report looking at "Government Imposed Charges On New Housing". As the title suggests CMHC was looking to see how much of the cost of a new house was due to government charges. Things like the levies that we charge to developers who build a new subdivision or the charges Aquatera collects for hooking up to the water system. Of the 32 municipalities surveyed in the report GP does very well, in fact we are 3rd lowest in the country after Yellowknife and Whitehorse. For example, if you bought a $300,000 house in GP about 7.5% (or $22,500) of the cost would have come from those government charges that the builder passed on in the price. On a $300,00 house in Prince George it would have been 10.7% ($32,100) or in Saskatoon 13.7% ($41,100). Some caveats I noticed: there are only 3 AB cities (GP, Edm & Cgy) and I don't know why that is, also the numbers are from 2006 and I believe that some of the charges have probably increased. Having said that, I'm pretty sure they didn't increase enough to push us up to the level of T-Dot. Here are two of the highlight charts (Click them to enlarge to a readable size) and a link to the full report. Tonight at council we debated selling the land that was Germaine Park and ultimately the sale was defeated. Anyone from Grande Prairie knows the area I'm talking about. It's been a concern downtown for a long time but I'm not going to go in to the long back story here. With this post I just wanted to take a moment and explain why I voted against selling it. Firstly, council made the decision to go ahead with the sale about a year ago and at the time the land was worth about $295,000. For some reason it took city staff some time to get the land on the market and in that intervening time, as we all know, the market changed. So when the land was actually listed it was now at the new appraised value of $195,000 - a drop of $100,000 in less than an year! So that's probably the biggest reason; what little land the city owns we hold land on behalf of the residents and I don't believe that the city should sell it at fire-sale prices. I think our job on council is to make responsible, long term, decisions that that get the best value for residents. We need to take a long term view and I thought this would have been short sighted. Secondly is the fact that even if we had sold it there was no guarantee something would have happened quickly on the site. As was mentioned by the city clerk at tonight's meeting there were conditions on the sale, the purchaser would have to build something. BUT, those conditions were only that they had to get a development permit within 5 years and then be finished construction within an additional 2 years. It could be 7 years before anything new opened on the site! I think the community is looking for improvement well before then. So, because of those two things I voted against the sale. The site is still an eyesore that detracts from our downtown and hurts local businesses so after the motion failed and the sale was off I proposed something else. I tried a motion to direct staff to bring back information on upgrading the site as a parking lot. I know we need to do something there - a proper parking lot would provide a useful asset for the area. It would clean up the look of the place and it's a good way to hold land until you're ready to do something else. Heck, it could even generate a little revenue if the stalls had meters or were rented. Unfortuantely that motion failed. So I guess we'll have a discussion at a committee about what to do next. I can't support practically giving away land that belongs to the residents of the city. I'll be pushing for the city to hold on to the land for the time being and to clean it up so it's a useful asset to our downtown. Hmmmm, I've just noticed that my blog has been getting pretty thin lately. In fact one could be forgiven if they mistook this for the Grande Prairie Public Library blog - it seems like most of my posts have been the library updates from Laurie. Well, I'll have to start posting about a wider variety stuff... tomorrow. For now, here's the latest update from the GPPL! The following programs are for school aged children and are unparented (although parents should remain in library). Programs will be held in the Story Room. Registration required. Please phone 532-3580 ext 226. Enjoy some stories and make a fantastic pop-up card for someone special. Take part in an hour of musical activities and stories. School is out so come to the library for some fun and funny activities. Earth Day is Wednesday April 22. Reduce Reuse Recycle. Earth friendly books full of great ideas will be on display for you to borrow. Join us for a Wii tournament. Saturdays, April 11 & 25 from 2:00 - 4:00 pm in the Story Room. For ages 12-18. Call 780-532-3580 ext 226 for more information. Canadian Points of View Reference Centre covers 100 topics presenting an overview, a point, a counterpoint, and a Critical Thinking Guide for each topic. It is a tool designed to provide students with a series of essays that present multiple sides of a current issue. Topics covered include: environment, health, human rights, crime, race, technology, substance abuse, and many more. Canadian Points of View Reference Centre provides the basis from which students can realize and develop persuasive arguments and essays, better understand controversial issues and develop analytical thinking skills. These online research tools and many more are available through the Library’s website at www.gppl.ab.ca. Have your membership card handy! I'm packing up to head down to Jasper this afternoon for council's spring strategic planning session. It'll be a quick couple of days with a facilitator and senior administration - we'll be leaving the mountains at 1:00 on Saturday. In the mean time the FCSS department is planning another "Conversation Café", this time looking at the issue of discrimination in GP. The Conversation Cafés are a informal open house focused around a particular topic where community members are invited to join the discussion and help us come up with ways to address various community issues. The event is set for Monday, April 6 at 7:00 p.m. at the Muskoseepi Park Pavilion. Residents can voice concerns and suggest possible solutions to be used to eradicate prejudice in Grande Prairie. All information collected during this discussion will be compiled and used to develop an Action Plan. The City of Grande Prairie is making a conscious effort to nurture the cultural diversity of our area by partnering with the Canadian Coalition of Municipalities Against Racism and Discrimination (CMARD). Are You An Artist Looking For Space? "Are you looking for a space to develope and expand your art? The Centre for Creative Arts has one studio vacancy. This aprox 100 square foot studio is suitable for most art mediums and could be shared between two artists. The space has lots of windows and is clean, quiet and bright. Lease is month by month, rent is $200 per month and tennants have 24/7 access to the Centre. Call Candace or Jackie at the Centre 780-814-6080 for more info." Find out more about GP Centre for Creative Arts here.